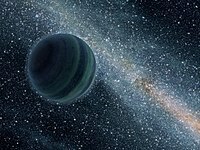 ↑ Free-Floating Planets – British Team Restakes Dubious Claim[dead link], Space.com, 18 Apr 2001, retrieved 5 Feb 2009. ↑ Neil DeGrasse Tyson in Cosmos: A spacetime Odyssey as referred to by NATIONAL GEOGRAPHIC. ↑ Stevenson, D. (1999). "Life-sustaining planets in interstellar space?". ↑ Debes, John H.; Steinn Sigurðsson (20 October 2007). 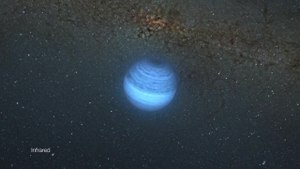 ↑ Physorg.com, May 18, 2011. Accessed May 2011. ↑ [T. Sumi et al. (2011). "Unbound or Distant Planetary Mass Population Detected by Gravitational Microlensing".